An innovative and practical surface spray that protects your home from unwanted pests, Hovex Outdoor Insect Spray is powerful and very easy to use. This is Do It Yourself Pest Control, you’ll never need to pay for a professional exterminator again. Not only does Hovex Outdoor Insect Spray kill when you spray it directly on a bug, it also leaves an invisible residue on surfaces. This residue is also fatal to cockroaches, spiders, ants, fleas anything trying to get into your home. This pressure sprayer bottle makes the whole process very easy no fuss and no mess. You just pump to build up the pressure, press the trigger and you’re ready to go. The pressurised spray can reach any area – you can even lock off the trigger for a constant spray. Each bottle of Hovex Outdoor Insect Spray covers 20 square metres plenty for the average home. Make sure you spray under eaves, guttering and pipes, around window frames, garages, patios, foundations and anywhere you’ve seen pests. For instance, if you see flies and mosquitoes hanging around the screen door, give it a spray. The first time you use Hovex Outdoor Insect Spray, you’ll need a Primary Pack, when you eventually want to reapply, all you’ll need is the recyclable refill bottle very handy, very economical. Apart from the big job when you form a complete barrier around your home it’s a good idea to keep the Hovex handy for special occasions. If guests are going to be dining al fresco, for instance, just give the area a spray beforehand and you’ll have a more pleasant meal. 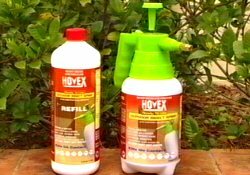 You can purchase Hovex Outdoor Insect Spray in supermarkets and hardware stores.